The Netflix docu-series Chef’s Table, at its heart, has always focused more on the chef than the table. What’s made the show a compelling watch is more than its gratuitous use of high-gloss food cinematography (though there is plenty)—it’s about the personal journeys of the chefs in profile, rather than restaurant or cuisine. That’s the magic formula—it’s about the humanity—as well as the poetic slow-motion shots, the dramatic score, the sweeping widescreen landscapes. David Gelb, creator of Chef’s Table (and director of Jiro Dreams Of Sushi) is back with a four-episode installment, this time focused on pastry chefs (premiering on Netflix April 13). Of the four featured on Chef’s Table: Pastry, one you’ve likely heard of from her role on MasterChef: Christina Tosi, owner and chef behind Momofuku Milk Bar. The three remaining pastry chefs make their living outside the U.S.: Will Goldfarb of Room 4 Dessert in Indonesia; Jordi Roca of Celler De Can Roca in Spain; Corrado Assenza of Caffe Sicilia in Sicily. Tosi is also the lone woman given a spotlight this season, a fact that cannot go unmentioned; as a slew of voices have rightfully pointed out within the male-dominated culinary field, pastry is the one arena that is dominated by women. Pastry chefs—and I am one myself—rarely share the spotlight with the savory chefs their own work compliments. They often find their own notoriety, as we see this season, in bakeries, gelato cafes, and rare dessert-only dining establishments. Their relative anonymity means Chef’s Table can do what it does best: dive deep into their psyches to help understand their passion and motivation. Each episode spends much time on their origin stories. Family plays a seminal role—the inheritance of the family’s gelato café with Assenza, or Jordi Roca’s acceptance of a pastry position within his brother’s restaurant. For Tosi, we see her passion for baking formed by scenes of her wandering through the food stalls of a state fair, and a multi-generational baking day with the women in Tosi’s family. A handful of years into her career, we witness the hustle of New York fine dining grind her away, enough to push her out of the kitchen. What most laypeople might not pick up on is behind the glamour of white tablecloth fine dining lies, for many, an unsustainable lifestyle that comes with working in those intense kitchens. Your passion gets tested time and time again. Many talented cooks leave the world of professional cooking behind, worn to a nub by the business. For a while, it appears as if Tosi might be another casualty of the industry, had she not carried her love of homestyle baking out the door with her. Tosi gets drawn back into the restaurant world, this time through the office door of chef David Chang’s Momofuku (Chang currently stars in another Netflix food series, Ugly Delicious). Chang can’t help but notice the sugar-fueled spark Tosi carries inside, and demands that she ignite her love of baking by making him the cookies and pies she fed the staff of her previous job at wd~50. It was a revelation: The low-brow flavors she grew up loving with the high-brow pastry technique she learned, and inside a microscopic workspace on Manhattan’s Lower East Side, Tosi developed the cookies, cakes, pies, and soft-serve ice creams that would make Momofuku Milk Bar one of America’s most famous and beloved sweets-and-pastries concepts. Goldfarb is the lone phoenix this season; the recurring theme in his story is outside forces trying to push him away from being a pastry chef. From discouraging teachers, immigration raids, repeated rejection for internships, reviews bad enough to cost multiple jobs, and shuttered restaurants, Goldfarb describes himself rising from the ashes like a mythical bird with the nine lives of a cat. Goldfarb’s story also displays one of the biggest truths of working as a pastry chef, that of always playing second fiddle to the savory chef. Creatively, Goldfarb is a disciple of El Bulli, a restaurant that anchored the modernist “molecular gastronomy” food movement. The unusual ingredients and futuristic techniques, often made possible by advances in scientific understanding, became the foundation for Goldfarb’s own style, one that challenged diners to interact and experience their desserts outside convention. After stepping outside the avant-garde setting of El Bulli, he set his sights on New York City. But even at some of the city’s more progressive restaurants, Goldfarb’s dishes often polarized guests. Bad reviews racked up, and Goldfarb cycled through jobs. But Chef’s Table episodes are often about redemption: At Room 4 Dessert, a dessert-only restaurant in New York City, Goldfarb found success and renown in the same dining community and critics confused by his approach. Stepping out of the shadows of another chef’s cuisine, Goldfarb’s desserts were finally untethered, and we watch his career take off. It seems we might leave Goldfarb in his dessert-only kitchen to enjoy his success, but his story doesn’t stop there: His New York restaurant shuttered over ego conflicts between Goldfarb and the ownership. He would find his second wind (or maybe it was his third, fourth, fifth) halfway around the world on the lush, tropical Indonesian island of Bali—where Goldfarb resurrected Room 4 Dessert. We are introduced to Spanish pastry chef Jordi Roca by whispers. Surely, I thought this was a poetic gimmick, perhaps pretentious. I immediately felt guilty for this thought even crossing my mind, as it was quickly explained as a case of laryngitis that has lingered for years. It’s rather alluring: We listen to the romantic language shyly crawl from his lips, with a hushed reverence that matches the cuisine he creates for Celler De Can Roca, the restaurant he and his two brothers operate. 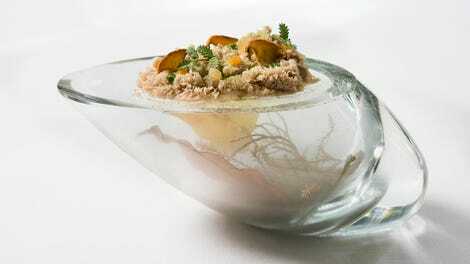 It is regarded as one of the world’s best restaurants—with ambition and menu prices to match. On the opposite end of the price tag spectrum is the story of Caffe Sicilia, the gelateria owned by Corrado Assenza. One of my favorite moments in the series comes at the opening of this episode, when we see many flavors of gelato spread with a spade onto the long pointy cones favored in Europe. For American viewers, who often dispute the differences between gelato and ice cream, we get an incredible example of gelato’s greatest feature, a soft, stretchy texture that comes from daily churning and warmer serving temperatures. This textural perfection is almost always lost stateside, where Italian flavors are usually hardened overnight and scooped like ice cream. Gelato made the way Assenza’s family has done for 124 years is so beautiful, I imagined myself buying plane tickets just moments into this episode for a taste. Both Assenza and Goldfarb draw much of their inspiration from the agricultural regions they live in, Assenza for the sake of tradition and cultural preservation, and Goldfarb capitalizing on the rare opportunity to use some of the pastry world’s keystone ingredients in their natural state. On Bali, Goldfarb discovers fresh chocolate, vanilla, spices, and coconuts, familiar ingredients only available to most of us shipped in boxes. These local ingredients open up incredible cinematic moments, of a rare almond harvest on Sicily, the fresh nuts freed from their fruit with the smashing of field rocks, or of Goldfarb harvesting cacao, pulling the pulpy white beans from brightly colored fruit, called capuacu, also used in Balinese cooking. One of the most striking ingredient origins is the sight of Roca standing alone in a dark sheep barn, carefully inhaling the scent of lambs’ wool, whispering the secrets of his most famous dish to us, a dessert he calls “lactic.” A segue way into the kitchen and we see the plated dish, ice cream and caramel made from sheep’s milk, topped with a tuft of sugar spun so fine it looks like the wool of a lamb itself. These ingredient origin scenes are at a natural advantage over the concrete jungle Tosi inhabits in New York, where instead we see her wandering the aisles of a 24-hour bodega. It is here, we learn, that the impending opening of another Momofuku restaurant drew inspiration from cereal milk, a cultural phenomenon many viewers will be familiar with, and an ingredient that makes multiple appearances as it’s one of the driving flavors behind her Milk Bar empire. What Tosi’s episode lacks in natural beauty, it more than makes up for with familiarity and nostalgia, something the other three episodes can’t provide. The missing charm from the interior of her vast Milk Bar factory is corrected with a thought-provoking diatribe on layer cakes that has the potential to alter the way future generations approach their own home baking. And of course, the charm in Tosi’s episode is Tosi herself, who makes her job look so effortless one might miss the relentless drive that brought her to the top of American baking, one slice of Crack Pie at a time. The season’s length (only four episodes) was my only disappointment. I know there is no shortage of engaging and incredible pastry talent worthy of this show, and I wish the season would have included more. I continue to look to Chef’s Table to share the stories of the people behind some of the world’s most exciting cuisine, and I hope this isn’t the show’s last attempt to highlight the sweetest of all the chefs. If the producers take their critics seriously, we will hopefully see more of the women who dominate this field next time. Dana Cree is a James Beard Award-nominated pastry chef, formerly of Chicago’s Blackbird and The Publican. She is the author of Hello, My Name Is Ice Cream and founder of the forthcoming shop Pretty Cool Ice Cream in Chicago’s Logan Square.